Fresh Breeze Non-Acid Disinfectant Bathroom Cleaner is a ready to use non-acid medical disinfectant cleaner that cleans, deodorizes, and disinfects in one easy step. Ideal for floors, walls, countertops, toilets, urinals, fixtures, or wherever cleanliness and germ and odor control are important. Fresh Breeze Non-Acid Disinfectant Bathroom Cleaner is a unique product which is pseudomonacidal, salmonellacidal, fungicidal, and virucidal. 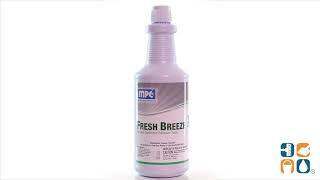 Fresh Breeze Non-Acid Disinfectant Bathroom Cleaner is effective against the HIV-1 (AIDS Virus). Fresh Breeze Non-Acid Disinfectant Bathroom Cleaner is authorized by the USDA: C-1. Excellent for deep cleaning while leaving a fresh scent. Call for 55 Gallon Drum pricing..